MOSCOW (AP) — Russia expects Barack Obama to show more flexibility in a dispute over U.S. missile defense plans in Europe following his re-election as president, a top official said Thursday. The controversy over the planned missile shield has strained the relations between the U.S. and Russia. Moscow has rejected Washington's assurances that the shield is intended to fend off potential missile threats from Iran and voiced concerns that the system could threaten Russia's nuclear deterrent. In March, Obama, unaware that he was speaking on an open microphone, told Dmitry Medvedev, then Russia's president, that he would have more flexibility on the issue after the November election. Deputy Prime Minister Dmitry Rogozin appeared to be trying to remind Obama of his promise when he said Thursday that Moscow hopes that the U.S. president will listen to Russia's concerns about the U.S.-led NATO missile defense for Europe. "We hope that President Obama after his re-election will be more flexible on the issue of taking into the account the opinions of Russia and others regarding a future configuration of NATO's missile defense," Rogozin told an international conference in Moscow. Russia has urged the U.S. to provide guarantees that any future shield is not aimed against it and threatened to target elements of the U.S. shield with missiles itself if no agreement is reached. U.S. promises to inform Moscow about details of the shield aren't enough, Deputy Foreign Minister Sergei Ryabkov said Thursday, adding that Moscow will continue pushing for firm guarantees from Washington. Moscow is still keen to work with NATO countries if circumstances allow, however. The Kremlin greeted Obama's re-election enthusiastically - in stark contrast to Obama's conspicuous slowness to offer Vladimir Putin lukewarm congratulations on winning a third presidential term in March, after a campaign filled with anti-U.S. rhetoric. Putin wrote Obama a telegram expressing hope that the two countries' relations would improve further and inviting Obama to visit Russia next year. 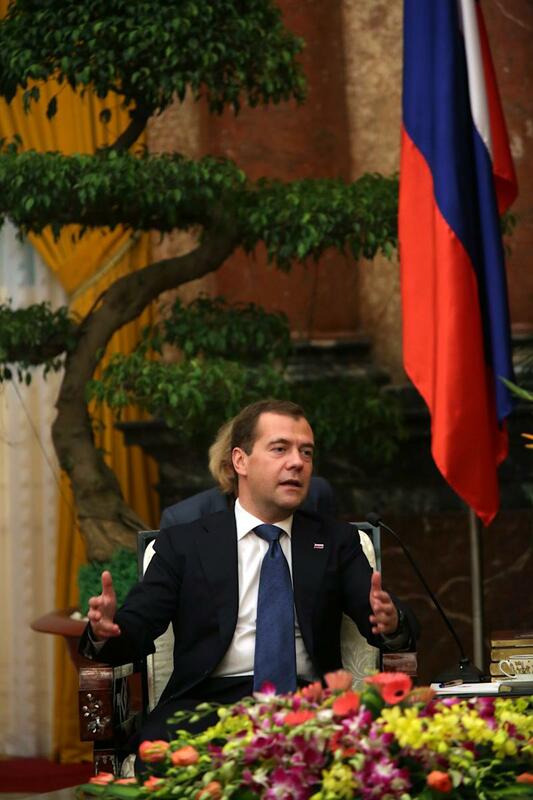 Referring to comments that Republican challenger Mitt Romney had made during the campaign, Medvedev said he was "happy that the man who considers Russia (its) No. 1 geopolitical foe won't be the president of this very large and important country." Former Russian Foreign Minister Igor Ivanov said he hoped that being on a second term will allow Obama to focus more on relations with Russia than Romney would have with his first term. "When people come in, the first year basically falls through, they work for the second one, and the third one's when the re-election campaign starts — that barely leaves them time to work with others," he said.